Alpine, Renault’s oddball performance division, is back. And company design chief Antony Villain says the Alpine Vision Concept “reflects 80 percent of the style of the forthcoming road car,” meaning we are one step closer to what’s coming than with the Celebration Concept a few months ago. 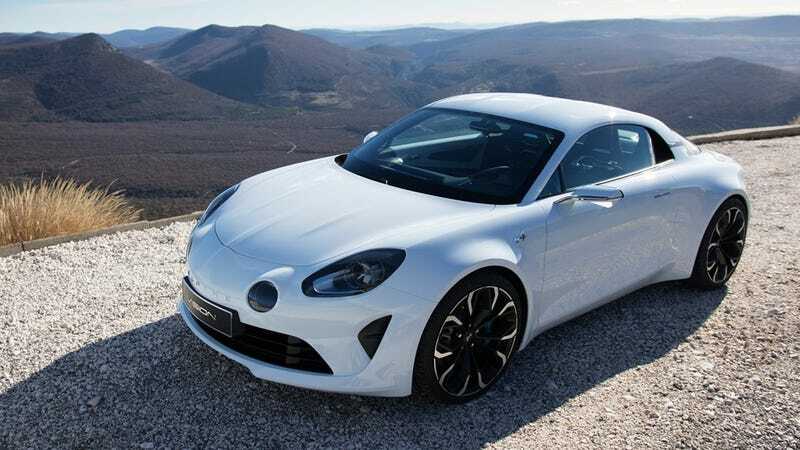 What Alpine just revealed in Monaco will hardly shock anybody as the changes are pretty minor, but imagine this car with bigger mirrors, and it hardly feels like a concept anymore. Compared to the blue show car, the Vision Concept sports a single central exhaust instead of two pipes, different headlights and wheels, but the trademark lines of the classic A110 are still where they should be. The Vision Concept packs a mid-mounted turbo four most likely linked to a double clutch gearbox like the one in many Renaultsport models, but tuned to give Alpine’s phoenix a zero to 60 MPH time of 4.5 seconds. Renault has applied for trademarks for the names AS1 and AS110, according to Car Magazine, while the production car is set to be revealed in full before the end of 2016, going on sale in the second quarter of 2017, in Europe initially and subsequently across five continents in total. Does that mean America is getting France’s budget Cayman too? You tell me. More on that after I saw it at Geneva. Oh, and did I mention it looks AMAZING?